TORONTO – The Toronto Raptors Training Centre was uncommonly crowded Tuesday morning, and it was only just the beginning. On Wednesday, ESPN will feature Canada’s only NBA team for an entire day of exclusive coverage leading up to the network’s nationally televised game between the Raptors and Philadelphia 76ers at 8 p.m. that evening. With Toronto All-Access – as they’re calling it – less than 24 hours away, the worldwide leader in sports took over the Raptors’ gym. Situated around the facility, multiple camera crews captured player arrivals and shot parts of practice. Kyle Lowry sat down with Rachel Nichols for an interview that will air on Wednesday’s edition of The Jump. It was a scene. The Raptors have surely come a long way from the team that went four straight seasons without playing a single game on U.S. national television earlier this decade. In fact, following the trade of Vince Carter in 2004, Toronto was only scheduled for four national TV games in a 10-year span. Even during this recent run – easily the best in franchise history, with five straight playoff appearances, a Conference Finals berth, and a team record 59-win season last year – they could only make moderate gains in that regard. It became something of a rallying cry for the team and its players. It was even the genesis of their popular tagline, We The North. Despite their success – all the wins, their two all-stars, Lowry and DeMar DeRozan, and rabid fan base – they still felt they were being overlooked. Why couldn’t they get on ESPN – which has a programming content partnership with TSN – or TNT more than a couple times a season? Why haven’t they played a Christmas Day game in 17 years? Why weren’t they a regular topic of discussion in the United States? As the Raptors prepare for their long awaited close-up, it’s not hard to see the progress they’ve made, or why they’re making it. That’s what the best record in the NBA and the presence of a true superstar will do. Wednesday’s game is one of 15 that Toronto will play on U.S. national TV this season – the most the team has been scheduled for since the Vince Carter era (2001-02). Call it the Kawhi Leonard effect. Suddenly, it’s impossible to ignore the Raptors. “For me, we have to build a brand that is worth talking about,” said team president Masai Ujiri. It’s been his mission since the moment he took over in 2013 and was the primary motivation behind a ruthless summer of business that saw him fire long-time head coach Dwane Casey and trade a franchise cornerstone in DeRozan. You can see the disdain in Ujiri’s eyes every time the Raptors aren’t mentioned among the NBA’s elite organizations. It pains him, but he understands the nature of the business. To get respect you have to earn respect. More than ever before, his team is in a position to do that. These few days are big for Ujiri and the Raptors all around. Giants of Africa, Ujiri’s not-for-profit organization, will host its annual gala to celebrate and honour the life of Nelson Mandela on Tuesday evening. The Raptors will continue to pay homage to the late South African president and Nobel Peace Prize winner during Wednesday’s game, which will be played on a Mandela 100 themed court. As for the game itself, it isn’t likely to disappoint. The young and talented 76ers come in as one of the NBA’s hottest teams. They’ve won 17 games – second only to the Raptors – including four in a row and eight of their last nine. Joel Embiid is having a MVP-calibre start to the season, sophomore Ben Simmons is nearly averaging a triple-double, and the newly acquired Jimmy Butler has been everything Sixers fans had hoped he would be, already making an impact on both ends of the floor and hitting clutch late-game shots. This will be the Raptors’ first chance to test themselves against the new-look 76ers, a team that seems poised to challenge them atop the East. “I think we’ve got two really similar teams tomorrow in similar situations, both playing good, high aspirations,” said Raptors head coach Nick Nurse. So far, the Raptors have fared well in the spotlight this season. They’re 2-1 in U.S. nationally televised games, with a pair of big wins – a decisive victory over the Celtics in October and last week’s overtime thriller against the Warriors – and an overtime loss in Boston last month. Nurse noticed some pep in his team’s step in practice on Tuesday, despite suffering a tough loss to Denver the night before. It’s hard not to get excited with all the cameras around, all the extra attention. Naturally, guys will downplay the importance of these games, but they mean something. If nothing else, there are simply more eyes on them. That means each player will almost certainly have family and friends watching that don’t normally get to see them play. It also means that, even though it’s just one game, the result can drastically alter the perception of a team. 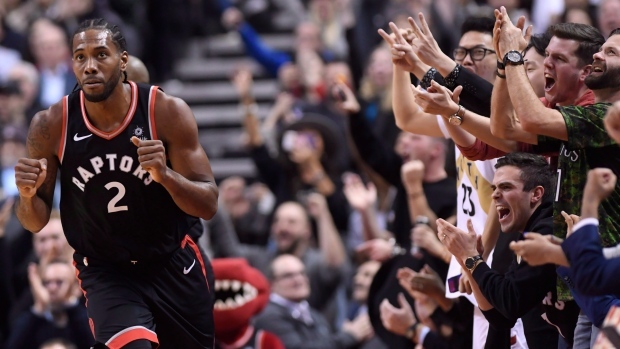 Finally, the Raptors are getting the attention they’ve been clamouring for, but they’re still out to prove they deserve it.